If you blow your budget playing black jack on the first day of your Vegas vacation, you don’t have to go home early. That’s because Las Vegas offers up more than card games and slot machines, it also deals out an incredible list of free things and stuff to do too. New York New York, TripAdvisor Certificate of Excellence Winner. Monte Carlo, TripAdvisor Certificate of Excellence Winner. Tropicana, 76% Approval Rating on TripAdvisor. Tuscany Suites, TripAdvisor Certificate of Excellence Winner. If you think the Las Vegas strip is over the top, wait till you check out the extravagant spectacles that take place at most of the hotels; and guess what—they are all free things to do. 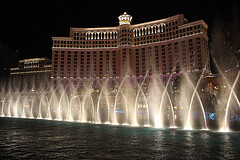 The Fountains at the Bellagio are a must see. Impeccably synchronized to music, this water and light show will truly dazzle you. It’s amazing stuff. Hear that rumble? That’s the sound of the 54-foot tall Volcano at the Mirage erupting. She blows her top every hour after dusk. The Sirens of Ti at the Treasure Island Hotel and Casino are equally as hot. Things get steamy as a shipload of beautiful temptresses lure a band of plundering pirates into their cove. This show boasts canon fire, music and outfits that would make Blackbeard himself blush. Always wanted to run off with the circus? Get your fix at the Circus Circus hotel where you can take in a circus act. It’s one of the longest running free shows on the strip and features aerialists, jugglers, trapeze artists and clowns. The Show in the Sky at The Rio features the dance and music of a BrazilianCarnival with one twist—a parade of brilliantly lit floats that pass by overhead on a guided rail that hangs from the ceiling. 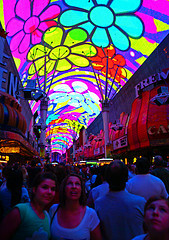 The Freemont Street Experience in downtown Las Vegas will have you looking up with amazement too. Here a canopy, 90 feet in the air, stretching five blocks and featuring 12 million lights, projects vivid visualsoverhead, all choreographed to music pumping through a 555,000-watt sound system. By day it’s a serene waterfall but at night the Mystic Falls Park at Sam’s Town transforms into the Sunset Stampede, a free dramatic laser and water show complete with a stirring symphonic score and a howling wolf. Still love to rock and roll? 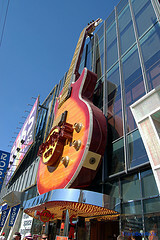 Then you’ll love the free self-guided tour at the Hard Rock Hotel. Check out all the cool stuff–autographed guitars and leather jackets worn by rock icons—they’ve even got Madonna’s underwear. How can you not flashback to some of your favourite concerts after visiting this place! If baseball is your game, the Sports Hall of Fame at the Las Vegas Club Casino is a must. Relive your childhood sports memories as you take in the largest collection of baseball memorabilia outside of Cooperstown. This place has stepped up to the plate with collectibles such as autographed photos, balls, gloves, jerseys and a World Series bat collection. Best of all it’s free to explore. When you’re in the midst of all the whirling of the slot machines, the buzz of the casino floors and the hustle and bustle of the Strip, it’s hard to imagine that nature has staked out its place in Las Vegas too, but it has. The Wildlife Habitat at the Flamingo is a tropical oasis for bleary-eyed gamblers and ducks, swans, exotic birds and a flock of 300 pink flamingos. 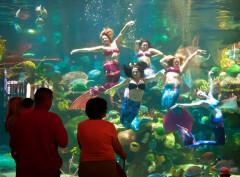 The Aquarium at the Silverton Hotel is a 117,000 gallon tank with colourful tropical fish, stingrays, sharks and–on Thursdays, Fridays and Saturdays–real, live mermaids! The Conservatory & Botanical Gardens at the Bellagio is no ordinary walk in the park. Here a staff of 120 create themed horticultural masterpieces five times a year, featuring thousands of beautiful plants, flowers and trees. As any first time visitor to Las Vegas will quickly discover, Vegas likes to dothings on another scale. 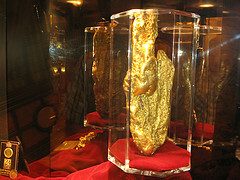 Drop by the Golden Nugget Casino and you can get face to face with the largest gold nugget in the world. It’s as big as a new born and almost weighs a whopping 62 pounds! Chocolate lovers will swoon at the sight of the largest chocolate fountain in the world in the Bellagio’s promenade. It’s a floor-to-ceiling Willy Wonka wonder. Watch and salivate as streams of dark, milk and white chocolate drizzle and dance 27 feet down from the ceiling. Lastly, no trip to Las Vegas would be complete without the ultimate free thing to do…a picture beside the world-famous “Welcome to Las Vegas” sign, located just south of Mandalay Bay. Feel like taking a day off from the slot machines and tables? 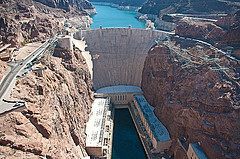 Rent a car or join atour group to see the magnificent Hoover Dam, the highest concrete dam in the Western Hemisphere and considered one of the top 10 construction achievements of the 20th century. Once you see it firsthand you’ll agree–it’s impressive stuff. A great spot for a scenic drive, hike or mountain biking excursion is Red Rock Canyon National Conservation Area. Part of the Mojave Desert, it gets its name from its towering red cliffs, and over the years has served as a set location for music videos, TV shows and movies such as Jurassic Park. A trip to the great outdoors wouldn’t be complete without hitting the road to visit the Grand Canyon. Carved over several millions of years by the Colorado River, the Canyon stretches over 275 miles long, is 18 miles wide in spots, and features mile-high canyon walls. It is an incredible, overwhelming, awesome sight to see. If you get through all of the free things and stuff to do in Las Vegas you can always brush up on your gambling skills—every hotel in Vegas offers free gaming lessons. A way to enjoy almost-free things to do in Las Vegas is to check Groupon, the money-saving website that features local discounts in 150 cities. Visit the Las Vegas Groupon page and you’ll find savings of anywhere from 40-90% on attractions, activities, tours, show tickets, dinner spots and accommodations. 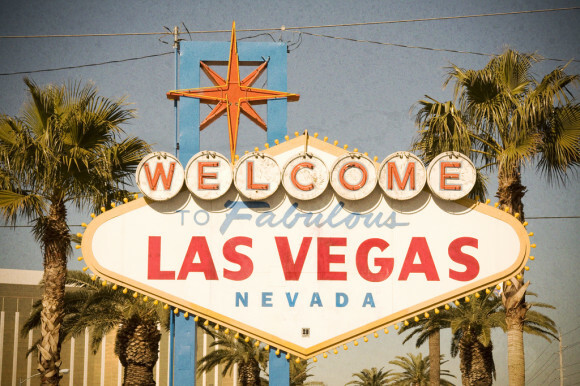 The Groupon Las Vegas page is a smart place to check out when you’re first planning your trip and even when you’re in the middle of your Las Vegas visit because new deals get added weekly and even daily many times. Photo Credits: ADTeasdale, sporadic, pfala, Visual Artist Frank Bonilla, Silverton Hotel, Ken Lund, kla4067, snowpeak and Images_of_Money.